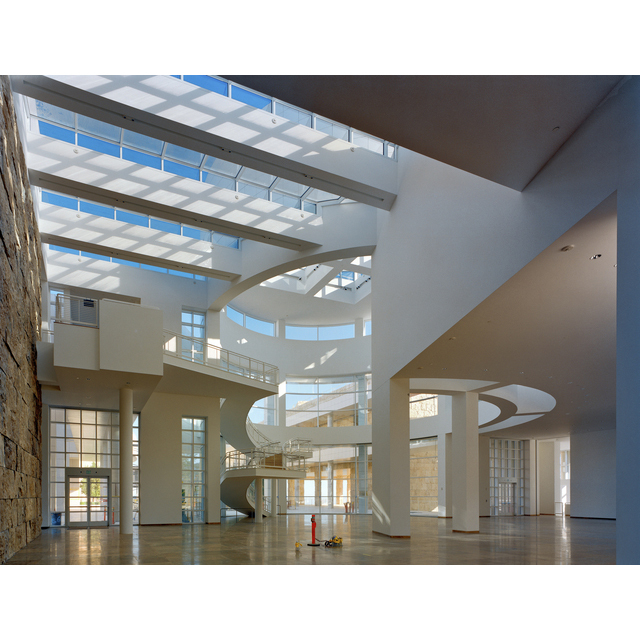 Before the Getty Center opened to the public in 1997, photographer Robert Polidori captured the half-installed galleries and impressive architecture of the museum while on an assignment from The New Yorker. With brilliant colors and beautiful light, these images provide striking behind-the-scenes views of the curatorial process. In this episode, Polidori discusses these photographs of the Getty, touching on his artistic philosophies, creative process, and career. ROBERT POLIDORI: Architectural photography is, in fact, a product shot, usually meant to glorify or sell a structure. I consider myself a habitat photographer. 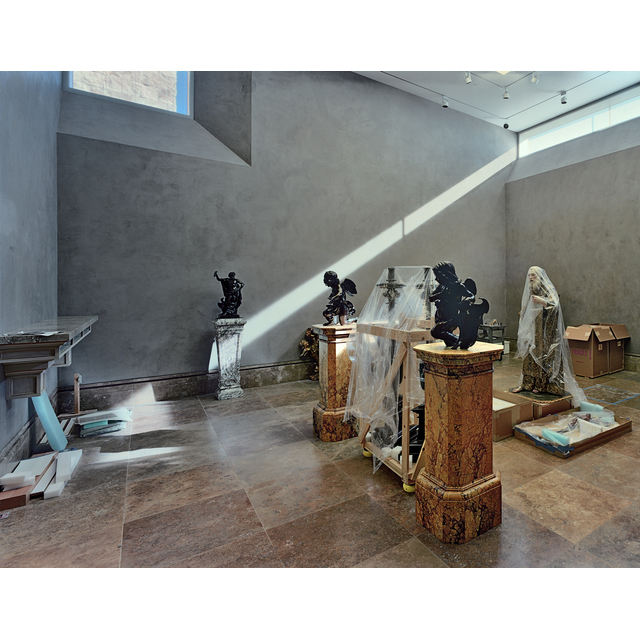 CUNO: In 1997, before the Getty Center opened its doors to the public, Robert Polidori photographed the galleries of the Getty Museum as they were being installed. In this episode, I speak with Polidori about this project, which began as an assignment from The New Yorker magazine. As part of the 20th anniversary of the Getty Center, the Getty Museum mounted an exhibition of twenty photographs by the acclaimed photographer Robert Polidori. Much admired for his beautiful and haunting depictions of human habitats, Polidori photographed the galleries of the Getty Museum in the fall of 1997, just weeks before they opened to the public. 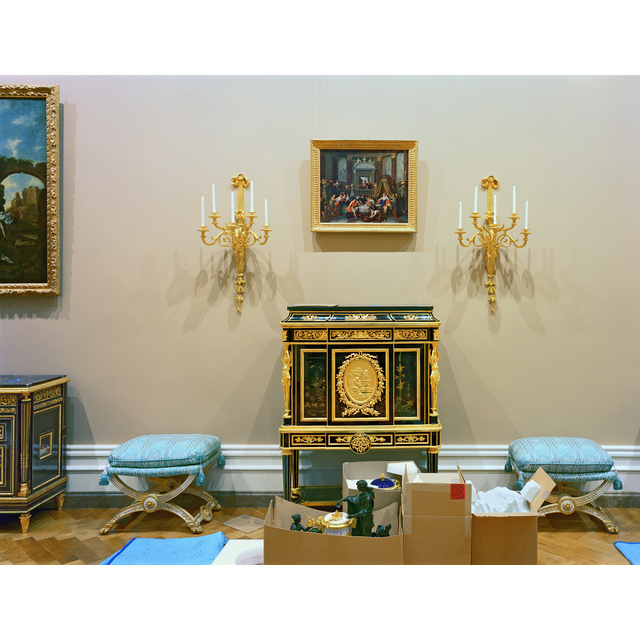 Originally an assignment from The New Yorker magazine, the series comprises twenty-four photographs that capture the curatorial process of installing works of art in museum galleries. Of the result, Polidori later said: “They were attempts on my part to bring some phenomenological trace, as well as psychological depth, to a subject matter that is usually invisible: the portrait of the curatorial act.” I spoke with Polidori in the museum galleries during the exhibition of his photographs. So we’re standing in a gallery of photographs from a series of photographs that you, Robert, took in 1997, inspired by or documenting the final weeks of the inaugural installation of the J. Paul Getty Museum. Which was it? Were you inspired by these galleries, or were you documenting the galleries? POLIDORI: That’s a good question. Well, I was sent to document it. Let’s be clear that I was not at the origin of this project; I was sent here by The New Yorker magazine. I had been maybe on staff there for a year or two. And you know, I wanted to please them. They were looking for, as most of the images that ended up in The New Yorker magazine, they weren’t looking for a suite of images; they were looking for one image. The text of the article dealt with Mr. Meier—Richard Meier is the architect—and a lot of the important people, the politics and money involved, and the time involved, in this big new project of a really new, major American museum, which was not covered from an artistic point of view, but from a socioeconomic, political point of view. So in fact, the picture that they ran is the one which we’re looking at here, of the lobby at 95% completion. CUNO: Describe the picture for us. The title of it is Entrance Hall, J. Paul Getty Museum. POLIDORI: Well, this is one of the main lobby areas. A lot of service desks and other service accoutrements were not yet installed. But the inside shell was finished, okay? So it’s like architecturally, it’s finished. You get the gist of it. But the la management is not yet there. CUNO: We’re looking at the main staircase, swirling up from the floor against a backdrop of rectilinear forms of white supports, whether vertical or horizontal. CUNO: With the light pouring down through skylights above and picking up off the— the waxed floor below. And in there, there’re some elements that you can see that are still left over from the architectural practice, elements that are left behind by workers. So there’s always a sense in your photographs, even in something that seems to be a photograph of a finished building, there’s always the sense of something in process. Something’s not yet complete about the project. POLIDORI: Right. I believe that these two objects here at the bottom are probably electrical wiring that are coming up from underneath the floor to feed, probably, what would be a service desk. CUNO: Now, what were you doing at this time that attracted The New Yorker to you in terms of this project? POLIDORI: I started to shoot in Versailles in 1983. And what, you know, took all my time and fascination there was what I would call a perpetual process of restoration. When you have an old structure with, say, a million and a half visitors per year, just their breathing, within the walls, over years, necessitates a certain amount of restoration, which is like the proverbial painting of the Golden Gate Bridge. Once they finish it, they have to start it again on the other side. And also, different curators have different views about which part of— of the museum’s past history that they want to feature. Because in a place such as Versailles, which, you know, was a residence for 150 to 200 years and then was another kind of museum after, it had— it’s been through several evolutions and lives and remodelings, from which they can choose to feature from. This, however, is not the case in a structure such as the Getty complex, because obviously, it was a new structure. So they’re setting it up the first time. It’s its first incarnation. CUNO: But what’s similar between this and Versailles is that your photographs tell a story. POLIDORI: Yes. But when I had access to this first lobby, you know, I wandered off and I saw what was going on in some of the rooms that were not yet— where the museological scenographic dressing was not yet complete. And this fascinates me, because I’m interested in seeing the intent of labors. And it’s very rare to see evidences of the curatorial act. Visitors usually just see the end product. CUNO: So we should be clear, for the listeners. So if you had returned from this shoot with just this picture of the architecture—that is, of the lobby of the Getty Museum—that would’ve been sufficient for the magazine? [Polidori: Oh, yes] The New Yorker wasn’t interested in a project as you finally produced, which is telling a story about the process of construction. POLIDORI: That’s so, yeah. I guess ’cause I have a unique kind of position that I was working for press. I have done press applications of my work. But you know, I always considered myself an artist, and as a photographer, I use the camera as a knowledge-acquisition instrument. I explore the world through the camera, both for myself and hopefully, for others who look at the pictures. And in fact, I wanna also mention that when I take a photo, I do think of people who will look at them later. I’m not one of those artists who say, “Oh, I just do this for myself.” I take them, of course, for myself; but mostly for other people, in as much as I try to imagine the perceptual process which a viewer will go through while looking at them. CUNO: There’s always a sense of activity having paused for a moment, some activity that preceded the photograph and that will succeed the photograph, as if there’s an event that has taken place. So you’re telling a story with these photographs. And it reminds me that you began your career as a filmmaker. CUNO: So there’s a kind of still moment in the process of a film in your photographs that reminds me of your early work. POLIDORI: Yes. Well, the kind of filmmaking that I was inspired by is not Hollywood film, that kind of storytelling. You know, the— one of the main inspirations in my life, visually or from the point of view of cinematography, is the work of Michael Snow, a film called Wavelength, which deals with the notion of temporality, the subject of time itself, and being able to extract from images, traces and processes in time. CUNO: How is that evident in this photograph titled Neo-Classical Furniture Gallery, J. Paul Getty Museum? [Polidori: Well—] Describe it for our listeners. POLIDORI: Well, for example, if we look on the left side of this image, where you see what would this— A shelf? You see at the bottom, those pieces of foam, so one who knows would deduce that other crates or other works of art once sat on them, but now they’re discarded. So most probably, these sculptures that are on top of the pedestal now were perhaps once sitting on top of these pieces of foam. You see some— the piece of plastic wrapped about— I guess these are candelabras in the back, where— to keep the dust away. One can induce[sic] that soon, later, they will be removed. So elements of the picture point to events or suggest events in the past or the future. CUNO: They look like they are dancers, as if they’ve paused in a performance. They have a role to play as characters in a scene. CUNO: And they’re also—and you haven’t mentioned this yet, but—they’re also very beautiful color photographs, in the way that you use color, or you identify the potential of color to be an active agent in the photograph. POLIDORI: Well, I learnt, I guess early on in— just by practice, I loved and was able to— not master, but I knew how to use the kinds of colors that one can get from color negative film. I love negative film because of color subtleties and its lack of contrast. I love images with low density contrast and high color contrast. I like to speak about these prints in particular, that these were done in an old analogical way. They’re the last truly analogical prints that I was ever involved with. And by that I mean that they were made by hand, without the use of any computer or digitizing device, in the old color analog enlarger. And in the way that I made prints since, where I use film, I scan it, which means I digitize it, and I have much better color and contrast control, by way of Photoshop. And then I output it to an imaging device, whether it be for paper, which has a color photographic emulsion, or to a digital ink jet process. So I guess what I’m trying to say is that yeah, the colors aren’t bad; but in my new work, I have even more control, is what I’m trying to say. But I try also not to use any artificial lighting. I try to always use natural lighting. And one of the ways that I get the kinds of colors that I want is just a simple trick—I tend to slightly overexpose the color negative, which makes it a dense negative. And simply make the exposure of the print, which necessitates a longer paper exposure. But this tends to give it a higher color saturation coefficient, which I liked, okay? CUNO: So that’s how you get the colors that you have. But I guess I was trying to get you to talk about the way you use color to compose a picture. So the picture we’re looking at, of the Neo-Classical sculpture gallery in the museum, you mentioned about the foam on the left. Well, that’s a baby blue [Polidori: CUNO (Cont. ): Yeah. Yes.] form, against a wall which is a kind of grayish blue. And the three walls that we see, all of the same painted color, are, because of the way the light falls in the room, different shades of this bluish gray, against a caramel-colored wall and caramel-colored plinths and dark blackish brown bronze sculpture. And then the way that the plastic sheets that are over the sculptures capture some of the light, reflect some of the light, and give a kind of crystalline presence in the picture. And you get this great Caravaggesque light that comes in from the outside on a diagonal. Bright, sharp light. You compose by color, as well as achieve your composition through the technical mastering of color, as you’ve just described. POLIDORI: Well, thank you for being so eloquent about what I achieved here. But frankly, fate had it so. I mean, I didn’t put these blue discarded foam pieces there; they happened to be there. There was no mise-en-scène done by me. I guess you get the luck that you search for. And I was lucky. I thought, by the way, it’s a beautiful museum. 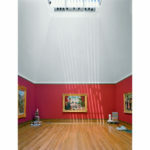 The lighting is— both natural and artificial light in this museum—is well done by someone who really thought it out. So it’s full of possibilities right from the get-go. So I try to recognize and frame such occurrences. You know, like if it’s there, I’m gonna use it, okay? CUNO: Well, let’s look at this picture, ’cause this is in a neighboring gallery and it’s more fully installed. And it’s a brighter yellowish painted wall with dark wooden furniture, with golden ornament on the furniture and with green, turquoisey pillows on the stools around the furniture. Talk about this picture. POLIDORI: Well there’s two things I like about this image. I like the composition and I like what it shows. Because you know, it’s called photography. The photo part, I always think it deals with the— see, the image itself. But the graphy part, which gets from graphics. You know, there’s the, say, the aspect ratio of the frame itself— You know, there are many harmonic and disharmonic ways to inhabit that rectangle. So any photographer will tell you that to make a pleasing image, you have to deal with rules of compositional balance. This is what’s called framing. You know, it goes under the general heading of framing. So I like its framing and I like what the picture shows, with the— those sculptures in those boxes, cardboard boxes, where they were brought sort of temporarily to later be placed. I like that sense that you know that it’s a transitional moment that’ll lead to others. Like— again, like with the earlier image, there’s references to moments or days that preceded it and moments that will follow it. CUNO: What I like about your framing of this part of the gallery, the scene that we’re looking at, is that clearly, the curator wanted to have a symmetrical composition to the objects’ placement in the gallery. So you’ve got these two stools with these pillows that are these turquoise green that I tried to describe just a moment ago. But you have a cabinet between them that is of darker color, with gold ornament on it, and that is rectilinear and cubic, in that certain aspects of it are rectilinear in form. With these filigreed candles, ornaments above on the wall, one on each side, framing a picture that is itself a rectangle, slightly rectangular, just like the cubic form of the furniture beneath it. And it has a similar set of tonality of the dark and the gold against it. So they’ve made this composition. But you’ve come and seen something else, which is something coming in from the left-hand side that breaks up— You could’ve repeated the composition of the curator, but you’ve added something to it. POLIDORI: Yeah. I mentioned that I try to refer to what precede and succeeds it. But at the same time, I want to have references to— that— It’s impossible to take a picture of the whole world. Or if you did, you wouldn’t see that much. So I try to have references always to that, to point out that this is a sub part of the whole, and references to the fact that it continues on, on one side or another. I do the same thing like in other images with doorways or windows that are looking towards another room that— To make it clear that this is part of the world, part of reality, but in fact, a sub-part of a larger continuum. CUNO: We’ve mentioned it earlier, but there’s a sense of storytelling about these photographs. And clearly, that’s related to the prior project and the previous ongoing project to this one that we mentioned, Versailles. Afterwards, there was also Cuba, Havana, and then there was New Orleans post Katrina. So you’re very interesting in how spaces, once inhabited by individuals, now seen through other means, after some sort of even has occurred, and the storytelling that’s involved in that. POLIDORI: Yeah. Okay. Many times, or especially earlier in my career, I was referred to as an architectural photographer. It’s certainly true that I’ve photographed a lot of architecture and interiors. But for me, architectural photography is, in fact, a product shot, usually meant to glorify or sell a structure. I consider myself a habitat photographer or a photographer that specializes in habitat. And I mean by that is how a space is used and have traces of human interventions, human dwelling, and let’s say generally, the psychological aspect of a room. A long time ago, I came up with this saying, that rooms are both metaphors and catalysts for states of being, and perhaps are a window to the soul. Now, I don’t, like, mention the window to the soul so much anymore. But what I’m interested in rooms is the way that people put in rooms, let’s say, speaking Cuba, ’cause now we’re speaking here of private dwellings. People tend to put on walls, who they think they are or who they want to be. So in a Freudian sense, it’s close to the notion of what Freud called the super ego. And for me, to photograph such interiors is a way of doing portraiture without the human being actually being present. But how much do you really know of an individual’s personal values, simply by looking at their face? You know somewhat. But by seeing what they put on the walls of their home, you know about what they value. So it’s a psychological portraiture of habitation. CUNO: There’s an element of time that’s important to these photographs, even in photographs in which there are no people or very little activity going on, except the natural activity of the light that falls into the room. Let’s look at this photograph over here titled European Painting, 1850-1900 Gallery, J. Paul Getty Museum. 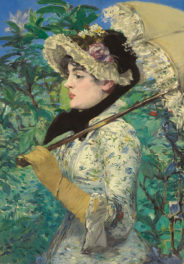 It’s photograph from one of the galleries of European painting, and this in particular, in the nineteenth century. And light has come through the skylight above in such a way as to fall onto the painting and the floor beneath the skylight with these oddly dramatic shafts of light. Obviously, this would be— have been changed before the opening of the galleries, because you wouldn’t want this light to interfere in the painting. But you captured the drama of this light falling into the room. POLIDORI: When I walked into this situation, okay I thought, subjectively speaking, it was beautiful. For me, okay, I said, “Wow, man, this is really California.” ’Cause you know, I was living in New York there. There’s often sunny days in New York, but you know, few like in— in high-rises and stuff, you usually don’t have this sort of streaming Venetian blinds lighting effect, okay? And for me, it felt like California, okay? I loved it. And as I was taking it, I didn’t really think about the anomaly moment that it actually was. Suddenly some people came, and they were upset that I was taking the picture, because this is an example of what was not supposed to happen. As we mentioned earlier, these images were taken before the official opening of the museum. 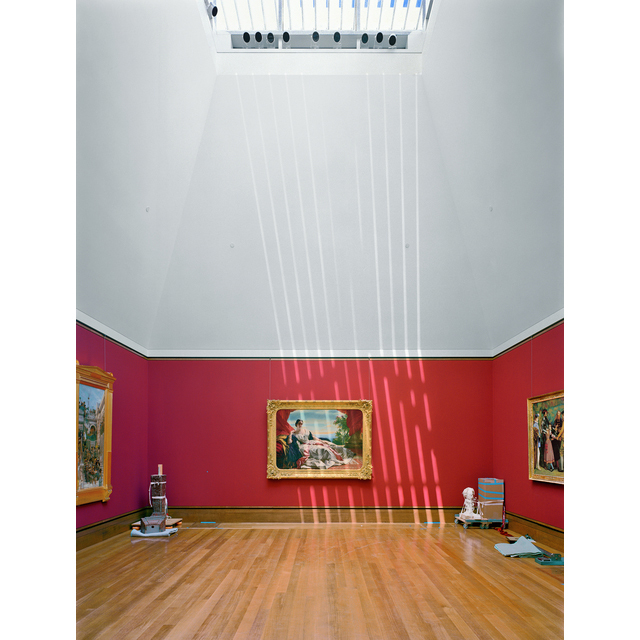 And the louvered system above the room is calibrated, they told me, by timers and stuff, with the movement of the sun, to prohibit sunlight from falling on the paintings with the, you know, with the UV properties that could damage them. So they were in the process of fixing it, and I took it before it was really tweaked up. So this is a moment which was not supposed to happen. CUNO: But it has an element of delight in it. There’s a kind of insertion into this room, controlled environment, of the natural element of the sun outside and the kind of idiosyncrasy of that. POLIDORI: Yes. And purely, again, from a subjective point of view, those light rays, streaks that are projected on the red wall, subjectively speaking, I find them very beautiful. And it makes the wall look like certain American Color Field paintings, which is one of the periods of American art that I appreciate highly. CUNO: The picture that the light is falling on is a portrait of a young, beautiful woman. And there’s a sense that she is being bathed by the light within the painting, but the light external to the painting, as well. Were you aware of that kind of wit and play? Or was that just a coincidence? You were really more interested in the light falling through the skylight itself? POLIDORI: [over Cuno] Well, it— I liked how it also fell on the painting, and I thought that it was harmonious with it. I would say that generally speaking, I try to be indifferent to beauty or ugliness in my first approach to a composition. But I don’t try to make anything ugly, and I don’t try to over beautify anything. Though people say I always make beautiful photos, so I guess I mostly beautify or I have a visceral reaction to it, so I choose it. But I thought this was a privileged moment. And for me, it was sort of the climax of that shoot. I knew they were gonna take that one. The photo of the entrance hall that we first looked at. And I took it for them. This one, I took for me. And frankly, like, you know, if I would have a big house and— you know, and I would look at my own work, if I was able to do that, I’d have this one. Okay. Now, so like the horizontal version, too, I like. I took two shots of it. And the horizontal, I put on the cover of the book. CUNO: So The New Yorker was interested in a picture; you produced more than a dozen such pictures. Did you conceive, at the time of this shoot of the museum, that it was going to be a portfolio of photographs or a group of photographs? 00:32:13:20 POLIDORI: Actually, I think The New Yorker ran two images. But I always would concentrate on having one. Because most of the time, they only have room for one. And in all fairness, you know, it’s a budgetary thing. It’s the amount of ads that they have, so the amounts of pages. So a lot of these types of decisions are dictated even to them. Even at times, they would want to; they don’t have the room, okay, or the budget. It’s a hard thing, to put a magazine together. It’s not one man’s decision; it’s a machine of decisions that come together. But the way I looked at it is that, you know, I’m here, I just go with what the subject dictates to me. The images jump out at me and I just go and take them, because I know soon they’re be gone. Might as well take them, because if I don’t, they won’t exist. CUNO: But as soon as you were here and seeing that there was potential for more, did you conceive of this to be a suite of photographs that would be identifiable as the Getty photographs? POLIDORI: No, that came later. But you know, I just don’t hang around doing nothing. I’m here, and I got the permission that I wanted to shoot in the inside, so I just went with it ’cause I found it interesting. I liked the subject. I do one thing at a time, you know. After they’re processed, I look at the contact sheets. You know, I think about it for a while. And I thought yes, that it would be a great suite of images, and I went ahead and had this portfolio made. I wasn’t sure exactly for whom or what. I think I must’ve had an idea that it would be a great idea to maybe introduce them, see, to the Getty or sell it to them—hint, hint—maybe. But nothing was, like, really sure. And often, I don’t really think that commercial strategically. I just go with it. CUNO: What’s it like to come back now, twenty years later, to see the Getty installed and mature after its twenty years of installation? POLIDORI: Well, I’ll say one thing; it aged well. It looked like it could’ve been built three or four or five years ago. It’s in very good shape. But I know that Richard Meier has that reputation as an architect. I know, like reading the article, that, you know, they didn’t skimp on— like, on anything. It had a sizeable budget and it was made for a long time, sort of posterity. As far as the interiors go, I thought it was handsome. I feel that the harmonics of the period rooms— if that’s what you call them—are good proportions. I like those lighting wells. I like the kind of light that it brings in. So what can I say? It’s a handsome museum. CUNO: Yeah. And what about the photographs? Have they worn well with you? POLIDORI: Yeah. I think so. They hold my interest. I’m not ashamed of them. Cause you know, not every subject is as worthy as another. But for me, images of museums that show the museological process are more personally interesting to my taste. So for me, they age well. I like them. CUNO: What are you working on now? POLIDORI: Well, you know, three or four things. I tend to work on many projects at the same time, because it takes a long time to get stuff done, to get the permissions, to get financing. So we spoke earlier of Cuba. You know, most of the pictures in my book on Havana, which came out in 2001, were taken from 1997 through 2001. However, last year, February of 2017, I went back to Havana, with the express intention of revisiting exactly the same places and spaces that I had photographed twenty years earlier. So that’s an ongoing project. Two, I’ve been shooting a lot in Naples, abandoned churches, of which there are many there. And what interests me in that project is a sort of a psychological view of what I call devotion abandoned. There’s a lot of altars, and personal altars of the remnants of people’s bodies. Like their bones with their names and that, you know, even the descendants who would go and give reverence to the remnants of their ancestors, even they’re gone. But the bones remain, and they made these little kind of altars that are dedicated to the remain[s] of loved ones. Three, since ’96, another project that I’ve been working on are auto-constructed cities. That is, dwellings made by inhabitants, without any architects. So they’re highly individualized, non-modular living structures. Because I’m interested in habitat, but I look at buildings, or accumulation of buildings, as a kind of nesting activity. CUNO: Well, Robert, thank you so much for your time this morning. 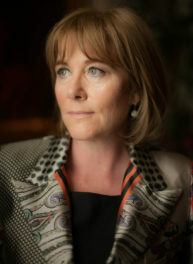 And the Getty’s very pleased and honored to be in your oeuvre, among your photographs. So we thank you. POLIDORI: Thank you very much, Jim. And I’ve found, like, being interviewed by you really a pleasurable thing. Like, you’re a really nice person. And yeah. And so thank you very much.